Don’t you just love easy to prepare breakfasts and desserts? Like with this Apple Oat Crunch which takes just 5 minutes to prepare and 10 minutes in the oven to create a crunchy golden brown topping. It really makes an amazingly quick dessert or breakfast to prepare. Actually there was a difficult part to this dessert…trying to take the pictures, with my sons waiting impatiently with spoons, ready to dig in.? So lesson learnt…next time double the recipe of whatever I am cooking or baking, let them get half and I can take pictures of the other half in peace. But I need to work fast…because they eat fast. Do you go through the same thing or is it just me,I would really love to know. Anyway let’s get to the easy part …making this amazing dessert. Apple oat crunch is made with canned apples mixed with apricot jam and apple juice, you can add raisins like I did, but it is optional. 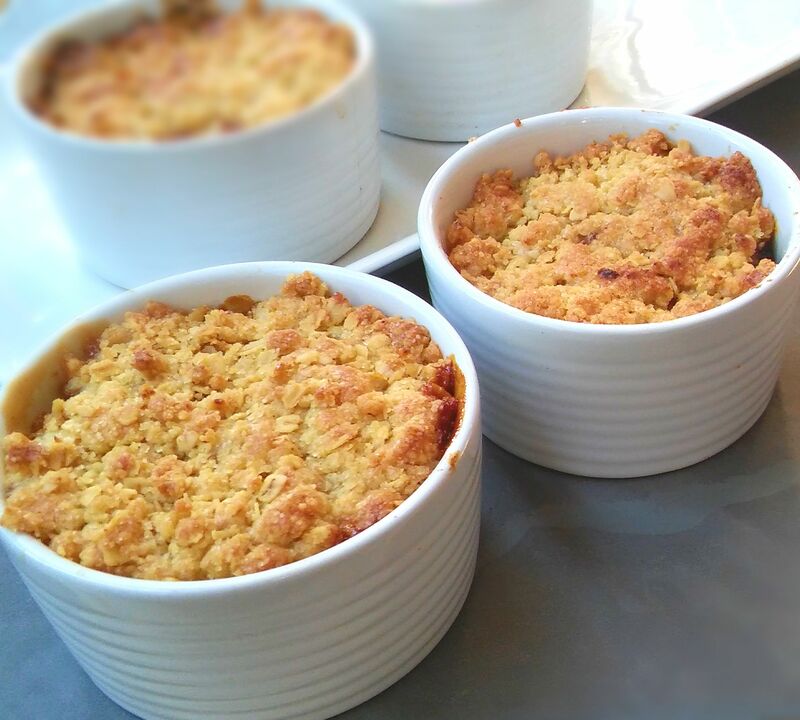 It is placed in individual ramekins or cups and topped with the oats, sugar,flour and butter mixture. Then it is simply put into the oven just until the top turns golden brown, say for about 10 minutes. You could leave it to cool a bit ( does not happen in my home) and then serve it with a dollop of whipped cream. Super simple. You could also use fresh apples if you prefer,it will just take about 10 minutes longer than using canned apples, because you have to peel, core and chop up the apples. If ever and whenever I use fresh apples, I usually steam it for about 5 minutes with the jam, apple juice and raisins just to soften it, to get it to the same texture and consistency of the canned apples. It is really not that much longer and it tastes just as delicious. 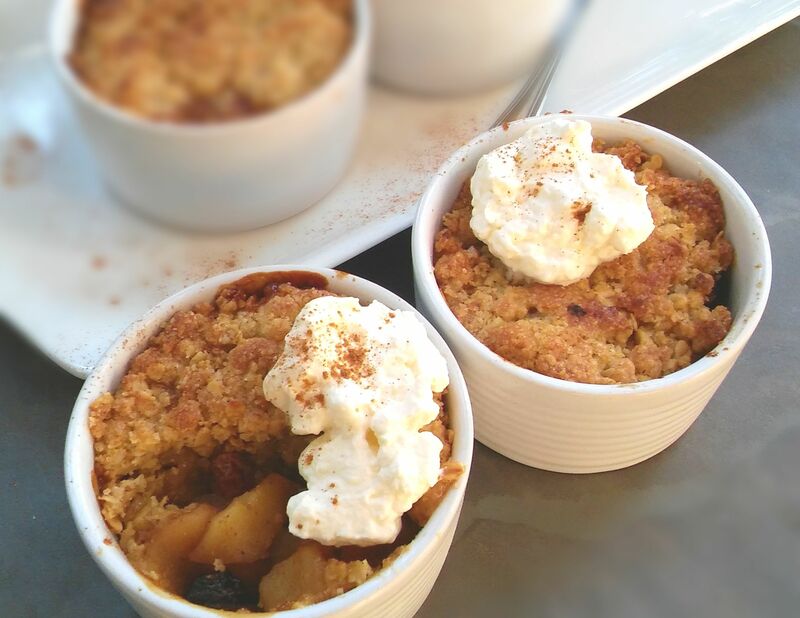 So either canned or fresh apples, this is a great dessert recipe for unexpected guests or that unexpected craving you have when you want an easy , and delicious dessert. Don't you just love easy to prepare desserts? 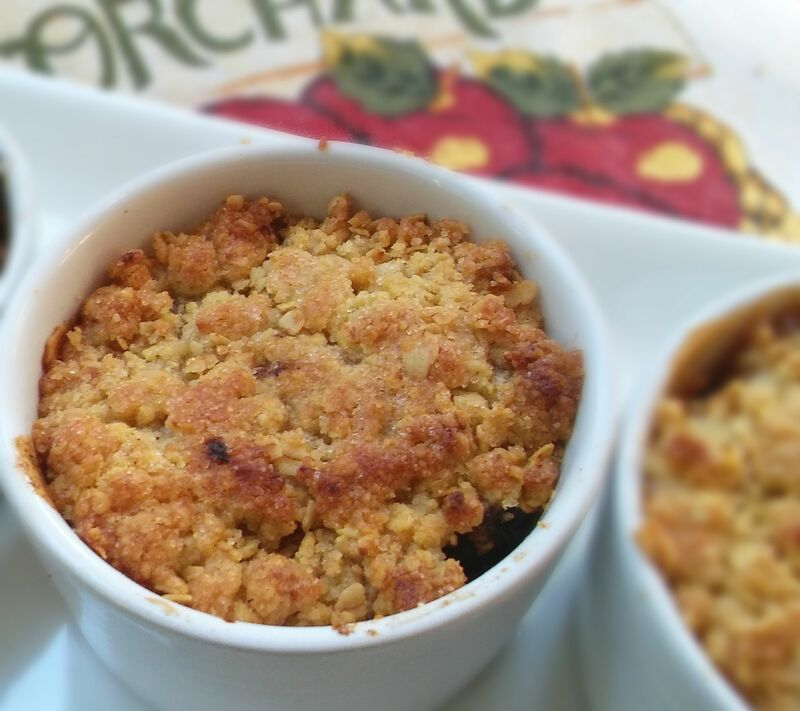 Like with this Apple Oat Crunch which takes just 5 minutes to prepare and 10 minutes to brown and crunch up the top. It really makes an amazingly quick dessert to prepare. If you are using fresh apples, peel the apples, remove the seeds and chop it up roughly. Then place in a small pot with the jam, apple juice, cinnamon and raisins if using. Cook on medium heat for about 5 minutes until soft. 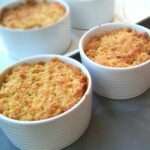 Arrange in 4 individual ramekins or four cups. Mix the oats, flour and sugar and rub in the butter OR margarine using your fingertips. Top the apples with the oat mixture, dot with butter and bake at 180ºC for about 10 minutes until golden brown. Serve with whipped cream and dusted powdered cinnamon. So nice and easy! Perfect taste of fall but with the summer heat in mind. Thank you Patrick…great one to save for autumn?. I love how quick and easy this is to make 🙂 yum! Thanks Pamela. I am really glad you like the recipe?. Hah Ashika you are definitely not alone. I have to either make and take pictures of something at night or while the boys are with their grandparents. And that includes my husband! This crunch sounds fantastic!! Haha…it is really crazy when you get that… ‘But mum, don’t you have enough pictures already…we are really hungry’. Thanks for the idea…definitely baking at night from now onwards? I love that thick buttery topping! So good! Thanks Angie…Have a great day? I never have to contend with hungry children waiting to eat my food–it’s always hungry ME who can’t wait til the photos are done to take a bite :). These gorgeous little desserts sound completely divine and I know I’d struggle not to eat every bite myself. Hope you’re having a great week, Ashika! Oh, lucky you, I just get a litle bite after the pictures have been taken?. Thanks Kelsie…these little desserts are seriously addictive. Thanks Kelly, Oh you won’t be disappointed with this recipe, it is really delicious.? I love this recipe! In Scotland we would call this apple crumble. You’ve made it so much more easier to make with your suggestion of using canned apples instead of fresh. I like that! I’ve never tried it with canned, only fresh. And whilst I don’t have your problem of your boys standing there with their spoons whilst trying to photograph a recipe, I do have my wife, Lynne doing exactly the same thing! Ha Ha! Thanks Neil, yes it does make this dessert easier using canned apples, and it is really just as delicious as fresh. Ha Ha… that is so cute, I am so glad that I am not the only one that goes through being rushed while taking pictures of my recipes…you know, just take it as a compliment…they really love our food ?